Child development refers to a child's ability to perform tasks of greater complexity as he gets older. The sequence at which a child develops is orderly and predictable, but different children develop at different rates. Child development involves language, social and motor skills. Physical development in children refers to the development of their motor skills, which involves using their bodies. According to North Dakota State University, physical development is defined by a child's gross motor, fine motor and balance or coordination skills. During the first few weeks and months of an infant's life, her movements are reflexive or involuntary in nature. Some reflex actions exhibited by the newborn infant include the startle reflex, which is elicited by sudden loud sounds or position changes, and the grasp reflex, in which an infant instinctively grasps objects put in her hands or feet. Between the ages of 1 month and 1 year, a child should be able to hold her head up on her own, sit without support, creep or crawl, walk, grasp objects on her own and pick up small objects with her thumb and forefinger. A toddler is between the ages of 1 and 3 years old. 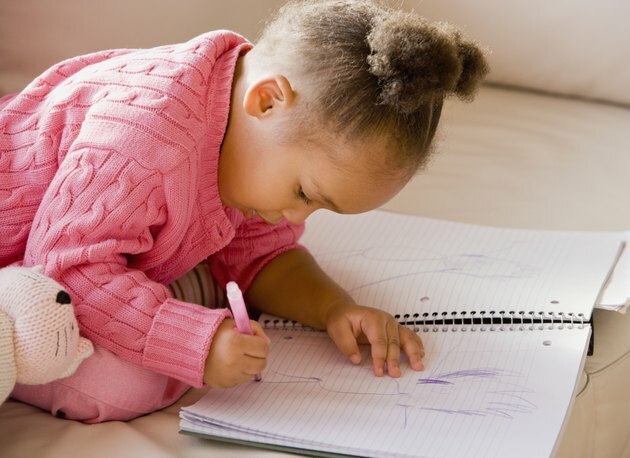 At this time, a child's physical development should include being able to walk without help, jump in place, go up a staircase, hold a cup of water, scribble with a crayon and copy a circle. During this period, a child should also be able to ride a tricycle and build a tower of blocks. The preschool years occur between the ages of 3 and 5 years old. The preschooler attains physical skills at this point that should include standing on one foot for ten seconds or more, hopping or skipping, swinging and climbing, throwing and catching a ball, using a fork and spoon and drawing a person with a body. At this stage, your preschooler may be able to take care of his toileting needs, according to the National Network for Child Care. A child between the ages of 6 and 12 years is considered a school-aged child. The movements of the school-aged child are more graceful and coordinated. School-aged children have good hand-eye coordination and are able to engage in activities like cutting and pasting, swimming, soccer, basketball, hiking and playing video games.